Many feel that money influences our representatives. Many believe that elections are decided by money rather than votes. I think this is correct, but only in so much as we believe that is true and willingly throw our vote away or not vote. I know this because I was one of those who felt helpless and didn’t bother voting. I was helping to creating an environment of hopelessness. An environment that promoted the idea that our neighbors are ignorant, dumb, and lazy. Then I realized something important. With this attitude, we will never elect any real change into office. We will think our personal vote doesn’t matter because it will be diluted by the mass of humanity who isn’t paying attention. But I was wrong. I was more than wrong, in fact. I was part of the problem! As much as people are focused on themselves and their wants and their opinions, they are also influneced by their environment. In fact, studies have shown if a person is given a test with an obvious answer, they will change their answer to the wrong one when they are put into a group of people who provide that wrong answer! It is indeed true, if you are not part of the solution, you are part of the problem. Devalue your vote and your fellow citizen’s capacity to do the right thing, and after a time, you will find that that is precisely the environment you live in. Value that vote. Ask others how they’re voting. And why. In Egypt (and Syria, and Tunisia, and Bahrain) people are rioting against military police because they don’t want to be told what to do by a dictator. They are being arrested without trial by secret police and being tortured because they want the right to vote. Don’t throw your vote away. The question to ask yourself is: What are the most important issues? And are the Democrats or Republicans addressing these issues, or avoiding them? 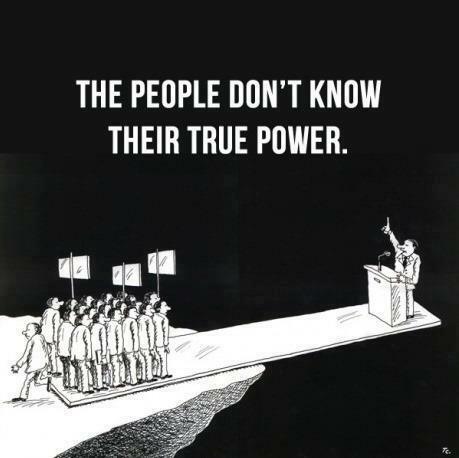 Remember, the power is still with us.